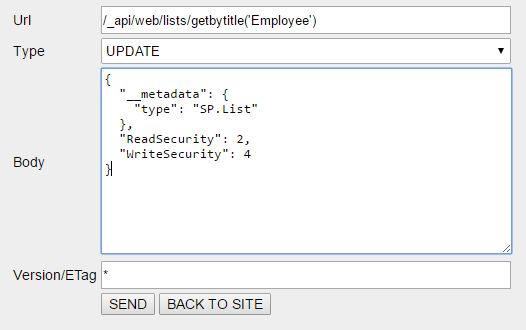 It is possible to set or update ReadSecurity or WriteSecurity using REST API and JSOM both. You need to make an UPDATE request to above end-point with above request body. I have tested it using My SP REST Client. The reason is: these (ReadSecurity & WriteSecurity) properties are not returned with the resource. See more on Getting properties that aren't returned with the resource. Not the answer you're looking for? Browse other questions tagged permissions rest item or ask your own question. Set List GUID when adding to SP.ListCollection (REST or JSOM)?